Life Lesson #1: if an M&T asks you to join them, don’t say no. 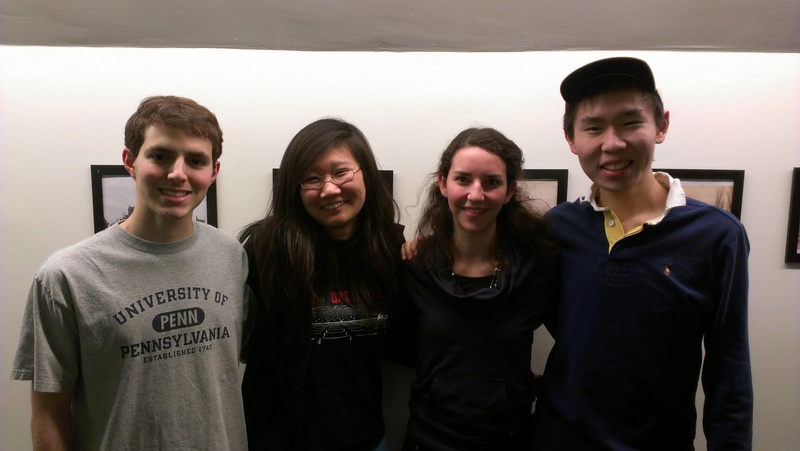 I didn’t even consider PennApps until my friend Nina approached me a week before it began. I’d been interested in web development, so I agreed on a whim. Good decision, if I may say so myself. Along with fellow freshman M&Ts Nina and Lauren and SEAS freshman Mitchell, I helped craft ZeitPlanner, a course schedule optimizer. Want to have classes that start as late as possible? Want to minimize awkward gaps between classes? Want to take 18 credits next semester? We’ve got you covered. We here at Penn are very lucky to have PennApps, the largest college hackathon in the world. Credit to Pulak, an M&T junior, who organizes it. Some of the best names in tech, including Microsoft, Yahoo, Dropbox, and Apple were present. It’s a wonderful opportunity to see and be seen (and snag lots of free things!). Life Lesson #2: even if you’re hard at work, take some time off. After hours of coding, it’s surprisingly rewarding to go hunting for free knick-knacks. My haul? Three t-shirts, five pens, headphones, three stickers, and $100 in Amazon Web Services. What I learned though was that PennApps is so much more than a technical exercise. It’s an entertaining experience and an instructive one at that. It can also be very rewarding. Life Lesson #3: never expect to fail. My team had no aspiration to win any accolades. After all, we were just a bunch of freshman having fun making something. At the end of the first round of judging though, we’d made it to the Top 20! It really comes to Life Lesson #4, the last one, I promise: qualitative metrics matter. We may not have been the most technically proficient team (although Mitchell boosted our strength in that department), but we certainly had one of the most useful products and one of the best presentations. In this regard, the M&T curriculum proved invaluable. It teaches you not only to be a good engineer, but how to present your work as well. I believe my team owes its success to our integrated education. How to sum up PennApps then? Yes, I was delirious after only three hours of sleep each night and yes, I sometimes wanted to punch my computer in the face (as if it had a face), but I would unquestionably do it again. Maybe I’ll be able to pick up a few more life lessons next time. Dylan is a current M&T freshman in the Class of 2016. He is contemplating studying Computer Science within Penn Engineering and has yet to declare his concentration in the Wharton School.